My recent research identifies three striking pieces of information about these rebel groups turned political parties. Many groups seeking power with guns would also like to arm themselves with political power received through the polls. My new Militant Group Electoral Participation (MGEP) dataset shows that more than 100 militant and ex-militant groups, out of 752 groups total (so 14 percent), have run candidates through parties overtly linked to their organizations between 1970 and 2010. “Violent” participation: when militant groups that are actively fighting a government also compete in elections. An example is Northern Ireland, where the militant Provisional Irish Republican Army (PIRA) began a coordinated electoral campaign through its political wing in the 1980s, Sinn Fein, but also continued waging war on the government into the 1990s. “Peaceful” participation: when ex-militant groups compete against a government typically with a settlement in place. An example is Nepal, where the Maoist militant group and the government signed a 2006 peace agreement that provided for combatants to transition to candidates; the militants then participated in 2008 and 2013 post-conflict elections. “Won” participation: when ex-militant groups hold elections after defeating a previous government on the battlefield. Examples are Nicaragua, where the Sandinistas held elections in 1984 after taking control of the state, and Namibia, where 1989 elections paved the way for a newly independent state. The causes and consequences of militant group electoral participation across these types likely vary, and existing work has just begun to address them. Nevertheless, recent work has begun to answer some of these questions. For example, my book focuses on peaceful participation–the most common form of participation in the MGEP dataset–and shows that these elections hold promise in terms of securing lasting stability. That finding is also borne out in other recent articles. The impact of peaceful participation, however, may not be as positive on other outcomes, such as regime type. Indeed, a stability-democracy tradeoff may arise because elites demand a status-quo bias, setting up a particular form of power-sharing. Peaceful participation, or other political activity by former rebels, may also not be very popular among average citizens, potentially producing resistance to referendums or later protest against the post-conflict governments. How well do political parties formed by militants or ex-militants do in elections? 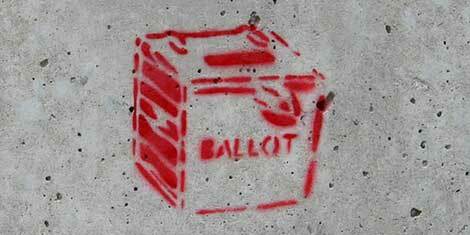 When do militant or ex-militant groups even want to participate in elections? Does having militant group electoral participation affect electoral competition, electoral integrity, or electoral contentiousness? Evidence from Colombia, for example, suggests peace agreements bringing rebel parties in changes state structures. Does it affect regime type? Evidence across post-conflict settings suggests that regimes often have “wartime origins,” although factors like how the war ends may not matter as much as common wisdom assumes. Does it change our thinking about whether voting and violence are substitutes? A special issue highlighted crossover between these tactics, showing, for example, that armed actors strategically displace civilians along voting cleavages. Cross-national studies have shown that the tactics are especially likely to be complements in territorial conflicts. Does it affect how conflict is fought? Armed groups participating in elections, for instance, may be less likely to use as much violence. Those seeking to stand candidates for elections may also change their tactics or strategies in other ways. For example, violent participation may be more likely when armed groups are also providing goods and services to their chosen political constituency. Or, beyond peace agreements, does militant group electoral participation affect how stable post-conflict contexts are? There is little evidence that elections overall help prolong peace, and certain contests may even increase the chances that the conflict will recur. But there are differences among elections: for example, those held immediately after conflict seem to be the most dangerous. Separating post-conflict elections by participation type may produce different findings–peaceful participation, for instance, seems to have the more optimistic results noted above. Finally, it is clear that even formalized militant group electoral participation is just scratching the surface of the ways in which those using violence seek to engage in the electoral process, and vice versa. In new work, Paul Staniland and I hypothesize about why armed actors engage in electoral processes in different ways, doing so covertly and indirectly, for example, in contrast to this overt and direct mechanism. The extension of conflict into politics, and vice versa, seems fairly common but we need to know much more about these topics to fully understand many conflicts and elections. Aila M Matanock is an Assistant Professor of Political Science at the University of California, Berkeley.